A playfull but extravagant cushion collection. The Fringe collection is a playful yet modern collection. High quality yarns are used in refreshing colour and material combinations. All materials are developed and eco friendly produced at the TextielLab in Tilburg, the Netherlands. Soft recycled cotton cushion cover with a woven pattern. Digital printed cotton tea towel. 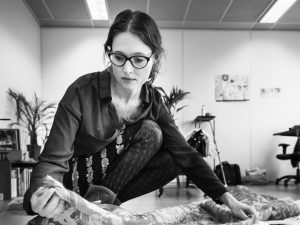 Roos Soetekouw (Amsterdam, 1984), textile designer, studied fashion design at the Amsterdam Fashion Institute. Her work is characterized by an outspoken, visual story and careful detailing. All of the works are produced in high-quality, durable materials. The designs reflect her curiosity about life and her ability to look at it from a unique perspective. Thanks to her fashion background, she has developed a talent for selecting bold colour combinations and combining different materials and textures to create luxurious interior fabrics.